We’re proud to live in a multicultural town. It’s a delight to hear Te Reo spoken in the street every day. The Otaki Mail is proud to report on the recent TPPA march, for the first time in both English and Te Reo. 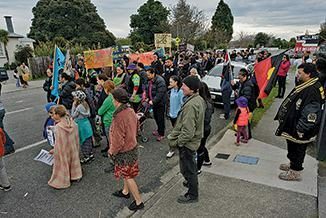 Nui taioreore o ngā tāngata i tae atu ki te hīkoi a te hapori “TPP NO WAY” mai i te Kohanga reo o Tuu Roa tae rawa atu ki Memorial Park, e tautohetohe ana mō te takatu a te kawanatanga kia hono ki te multi-national partnership. Ētahi o ngā tautohe e korihi ana, ētahi atu e kawea e mau ana i ngaa kara hoki i a rātau e hīkoi ana i te taupa i a rātau tautohe e pā ana ki te Trans Pacific kaupapa whakaritenga. I te waa e kotahi ana te noho a te hapori ki te papatakaro, e mihi atu eetahi o ngaa kaikorero ki te hapori. Ko tā rātau kōrero mō te whakaritenga a te kaupapa te kaha hoki, ahakoa ētahi ririki nō ngā kura e rua me ngaa nohinohi noo te kohanga reo, te taea te pehea i ta rātau tautohe atu, Māori mai Pakeha mai. I akiaki tētahi tangata i te hunga tautoko kia rehitatia i tana “KORE TPPA” ki runga i te wharangi ipurangi o te kawanatanga, hoki kia uru atu ki Te Whanagnui-a-tara hiikoi ai ki parliment, te mahi whakamutunga ma te wiki TPPA ki Pōneke. 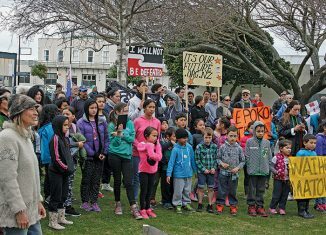 About 150 people joined the locally organised TTP NO WAY hikoi from the Tuu Roa Kohanga Reo to Memorial Park, vociferously protesting against the government’s negotiations to join the multi-national partnership. Some protesters were singing, some carried banners and some were chanting their protests against joining the Trans Pacific Partnership Agreement. Once they all gathered in the park, speakers were introduced. 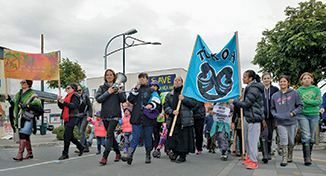 Their views on the proposed agreement were strong, although the younger children from the two kura and the tinies from two of the kohanga reo in the area, would not have grasped the message, whether in Maori or English. While Waikawa Beach’s Batch Hales pointed out the policies would not reduce the poverty gap between rich and poor, won’t improve people’s health, protect our clean green image or include the environment or encourage regional development. Other protester’s views included the lack requirements to keep New Zealand GE free, nor reduce foreign ownership – they believe it does the opposite and encourages it. Nor does it protect our financial stability or democratic rights. One person urged people to register their “NO TPPA” on the government website and to get into Wellington the next day to take part in the march to parliament, the final action in the Wellington TPPA Action Week.